Book Adventures: Children's Tuesday: One Boy, No Water & Jolly Fish Press! Children's Tuesday: One Boy, No Water & Jolly Fish Press! Coming September 2012 from Jolly Fish Press is One Boy, No Water by Lehua Parker! One Boy, No Water is the first in the middle grade, Niuhi Shark Adventure Series based on the Hawaiian legend of the Niuhi shark people. How cool is that? Seriously, I'm looking forward to this. I love legends and I love the culture of the Pacific! Aunty Lehua is from Hawaii and now lives in Utah. Because of her background, her debut novel is not only steeped in island lore, but also contains Pidgin, the melting-pot language of Hawaii. Aunty even has a "Learning the Lingo" feature on her blog! You can also "like" her Facebook page here. One Boy, No Water, the first of five books in the Niuhi Shark Adventure Series, is a fantasy based on an island folklore centered on the Niuhi shark people in Hawaii—imagine water people, angry teenagers, confused parents, a looming mystery, and man-eating sharks! The book is scheduled for a Fall 2012 release. Born and raised in Hawaii, Parker—also known as "Aunty Lehua"—has always been an advocate of Hawaiian culture and literature. Her writings often feature her island heritage and the unique Hawaiian pidgin. 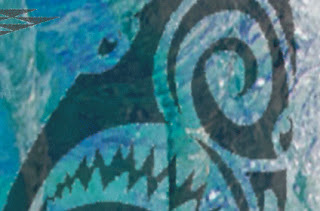 The Niuhi Shark Adventure Series will be JFP's first middle grade series to be released in the Fall of 2012. For excerpts from One Boy, No Water, click here. Aunty Lehua says, "Since big predatory sharks tend to hunt and travel alone, most Hawaiian shape-shifter shark stories are about a particular individual and not about whole societies of shape-shifting sharks. The Niuhi Shark People of Hohonukai only exist in the [Niuhi Shark Adventure] novels." Jolly Fish Press is a new publishing house in Provo! If you're local and would like to meet someone from JFP, come to the annual Publishers' Fair on BYU campus TOMORROW from noon - 5pm in the Wilkinson Student Center Garden Court! This event is totally open to the public so you should come! I'm excited to see what other books JFP acquires! Maybe it will be YOURS!